ABSTRACT: Many studies relating to long-term global change and climate variability rely on proxy data from fossils and geochemistry to reconstruct paleoenvironments. Such data can also contribute to our understanding of biodiversity through time. In this respect, calcareous nannofossils are an excellent proxy resource, with a number of taxa having become established as indices of paleotemperature and/or paleofertility. However, although the majority of the original works that identified these nannofossil proxies are basically sound, the application of the proxies to a widening range of scenarios, in differing paleoenvironmental situations and time-intervals, is beginning to challenge some of our original assumptions. Consequently, there is a growing need for more precise evaluations of the status of these proxies. In addition, there are a number of nannofossil taxa which have proxy potential but which require focused study to determine the extent of their utility. Here, we point to the problems associated with some of the most commonly used Mesozoic nannofossil proxy taxa (Watznaueria spp., Biscutum constans, Zeugrhabdotus erectus, Nannoconus spp. ), and introduce the taxon Micula as a potential fertility proxy, by virtue of its high abundance in particular environments. 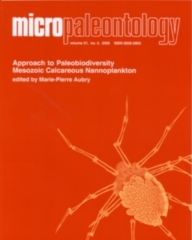 Further to this, we outline a program that is in progress, involving geochemical ‘finger-printing’ of individual taxa combined with nannofossil statistical data, that should enable us to better understand the paleoecological preferences of these taxa and so help in restoring confidence in these proxies and provide a better understanding of their potential limitations.